Blue Gold promote the campaign with posters around the school. Every year, the Blue Gold club holds numerous activities and fundraisers such as Bingo Night and Thanksgiving Pie raffles to raise money for DFRC. The Delaware Foundation for Reaching Citizens describes themselves as “A well-respected Delaware foundation dedicated to raising funds and consciousness in support of programs that enrich the lives of Delawareans with intellectual disABILITIES”. With Blue Gold being one of Padua’s most popular clubs, many students become actively involved in working with and spreading the mission of the foundation. 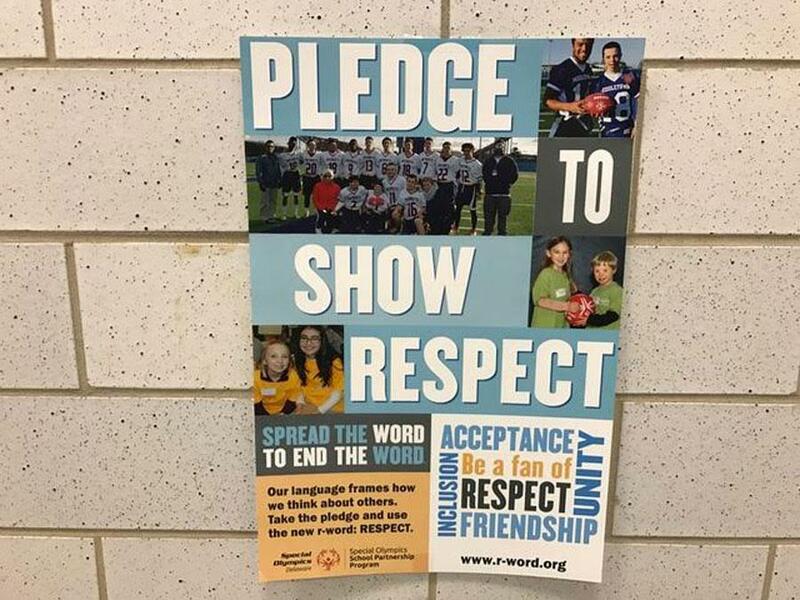 This year, Blue Gold once again begins the to “Spread the Word to End the Word” campaign which encourages young teens to pledge to abstain from using the word “retarded”. According to the pledge’s website, students take action because “The R-word hurts because it is exclusive. It’s offensive. It’s derogatory.” Junior Trysha O. says “I think it’s a really powerful campaign for students to take part in”. Padua’s Blue Gold dedicates a week to raise funds for the DFRC, with activities such as raffling prizes and purchasing frozen yogurt. The week concludes with the annual Blue Gold Bingo. Trysha says “Being a part of Blue Gold is a rewarding experience because in it you get to meet a lot of new people and learn about their experiences”.